Tea Happiness- A blog on tea drinking, tea history, tea industry interviews, NYC tea experiences! : ...On Tea Education. My daughter the budding tea lover recently asked me to do a presentation on tea for her 3rd grade class. I’m excited to expose children this young to the wonders of tea, and use their senses to enjoy various herbals. After speaking with her teacher about the idea, it got me thinking- why am I qualified to teach children about tea? The tea industry is mixed on the topic of tea education, and there is good reason for it. Professional certification programs vary in quality and depth, and anyone with a fat wallet can take one. There is no standard of excellence to achieve, no way of knowing that you are getting a proper tea education. Tea education is a relatively new industry in the US. Because of this, there are many people jumping on the education bandwagon and nothing is standardized. World of Tea recently published an excellent article calling out the use of the term tea sommelier, and I couldn't agree more with this. I am a big believer in education, but there needs to be a unified standard for teaching, specific levels of mastery, and precise areas of focus. It's hard for me to really critique this emerging industry, as someone who has both a bachelor's and master's degree. Clearly I'm an advocate for higher education. But with lack of scholarships, and the obvious lack of educational standards, can I even say we should have formal tea education for those that want it? Before I go any further, let me be quite frank about one thing- I'm currently enrolled in a tea sommelier program. Yup! Does that make me a hypocrite? I don't think so. As a full time working mom, freelance writer, and tea lover, finding the time to educate myself can be a challenge. If I have a few spare minutes to myself, I may decide to spend them reading about or drinking tea, but maybe not with the motivation or focus to fully absorb what I'm learning. For a long time I wanted an outlet to help further my tea education. With my schedule, I need to specifically carve out time and have essays and exams to motivate me. I applaud those that don’t need this kind of motivation to further their tea knowledge, but for me, it’s a necessity! To be clear, I'm talking about a specific certification level, one where you are supposed to gain a high level of tea understanding. Most of the formal tea education programs call this certification status 'tea sommelier'. Some of the backlash in the industry has to do with the term, 'sommelier'. This is a term obviously borrowed from the wine industry and has no true basis in tea education. It indicates a very high level of education and palate refinement. I don't love the term 'tea sommelier' either. It is a borrowed term and doesn’t come close to the same level of expertise. But of course it is a useful word since it indicates a level of knowledge about flavors, terroir, preparation, pairings... things that sommeliers are expected to understand. But of course, just saying you are a tea sommelier doesn't mean anything. There are no specific educational requirements, or years of mastery like that of a wine sommelier. Since you can never master tea, a tea sommelier (or similar title) needs to have a specified skill set. Just like there are different majors at universities, there should be different areas of certification and levels of study. I wonder, what should we call students such as me? Am I a tea intern? A tea student? A Tea jedi-in-training? An aspiring tea professional? Of course, we need to scrutinize the US tea education industry, and this is slowly starting to happen. Who are the teachers, why are they qualified to teach? Why bother to get a formal education at all? At this point, just about anyone can create a tea education program. Looking for a tea sommelier course can cause sensory overload. Courses range in price and time commitment. I've heard horror stories of poorly trained teachers, stale tea provided for tastings, all sorts of drama around the tea education system. What’s a prospective student to do? Finding a school isn’t as easy as it seems. Obviously there is a need for a motivated discussion on reforming and standardizing tea education. Set a high bar to create trust in the tea educational system, and hold ‘tea professionals’ to a specific level of proficiency. In less than a week I'll be attending the World Tea Expo (So excited! So nervous! ), and there is an exciting panel on re-evaluating tea education. I cannot wait to attend this session and hear the discussion. I will be taking notes and will report back. If you have any specific questions you’d like to me to raise at this WTE session, please let me know in the comments. As tea students, let’s get our voices heard! Just to note, these are just my humble thoughts about tea education. I don't think you need to have a formal tea education to be passionate about tea, or have professional knowledge. Nor do you need it to be successful in the tea industry. But for people like me that want a formal education, there is work to be done. Well argued, Sara, and so glad you wrote it! I've also read the controversy of late re. the qualifications of a tea sommelier. I have been hesitant to wade into the discussion, but since I am a certified tea sommelier I might have something to contribute. While my business cards say 'tea sommelier', I will forever consider myself a student of tea. 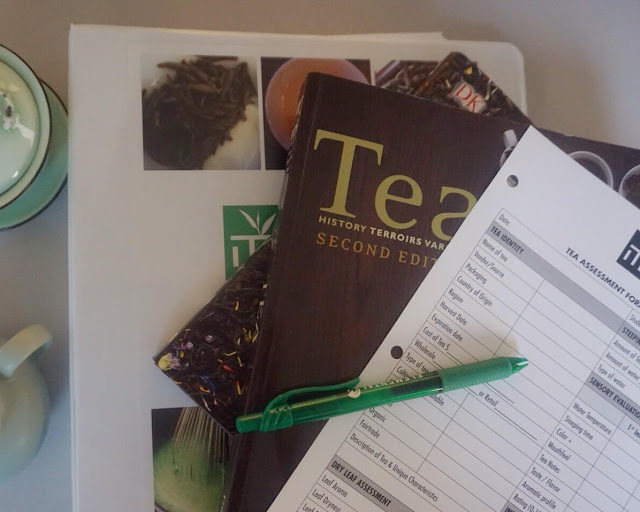 The program I was enrolled in, was, at the time, (7 years ago) one of only a few in North America and I feel fortunate to have studied at a time when the tea education marketplace was not so crowded. There could be more appropriate names for what I do. I will occasionally introduce myself as a tea practitioner or tea professional if I think people are going to cringe at "tea sommelier". The important thing for me to remember is that it is impossible to know everything about tea, so the study continues. I would also like to see standards for tea education excellence. I hope that because this is all so new, eventually consumers (students) will bring their own judgements on the education industry. It is frustrating for me to notice that many have the title without, what I think, should be the minimum required knowledge. It would be good to feel confident when you graduate, that your intense study means something and isn't just a title that someone can buy for a weekend's worth of study. In a way this issue is a reflection of an increase in the desire for some to make tea their life's work. Most of the time though, I've found that people really just want "Tea 101", but can only find more involved programs, so there is a need also for elementary study which is what a tea sommelier should be qualified to do. I'm also looking forward to the "re-evaluating tea education" conference session at World Tea Expo. See you there! Thank you so much for sharing your thoughts Linda! Looking forward to seeing you! Thanks for publishing this, Sara. I wish I could attend the seminar on tea education at Expo. I agree that the industry should move toward a more standardized assessment of knowledge and skills for tea sommelier, if that is even the right word. (As many have pointed out, the word itself specifically refers to wine in French and traditionally has a clear meaning.) At the very least, there should be an industry-wide standardized exam for anyone who claims a certain level of certification. I think this assessment also has to include hands-on demonstration, blind tasting and cupping skills evaluated by established experts. People can acquire fundamental knowledge in many different ways--whether by courses or years of industry and field experience. I think a standardized assessment is the first screen to determine whether people from various backgrounds have reached a minimum level of knowledge, ability and practical know-how. I recently finished a two-year sommelier certification with the World Tea Academy and found it to be an excellent foundation: on average, I'd say it encompassed maybe 300-400 hours or more of readings, cuppings, class discussion and exams over the course of that time, though the WTA would probably have a more specific estimate. I think of it merely as a jumping-off point, combined with thousands of other hours of tastings, company visits and interviews, and other tea-related pursuits. Having said that, two years in any educational program and any industry is a drop in the bucket and hardly enough to call oneself anything close to an expert in anything, including tea. (I would say the same in professional writing, for example. I have a master's degree in writing as well as 15 years of professional experience as a writer, and have worked with far more experienced writers and journalists over the course of my career as well as other professional experts with thirty sometimes forty years of experience at world-class firms. As it happens, anyone in today's culture can and will call himself or herself a writer or any kind of professional expert one could cite without having any real training or education. In general, I think critics have to factor in each individual's credentials, which involve a combination of education and long-term industry experience in any field. I, too, shy away from the word tea sommelier most of the time, for different reasons, partly out of respect for the French meaning, for the rigorous standards met by wine sommeliers and the experience of long-time tea industry professionals. I don't think, though, that those who do complete sommelier programs should be shamed or made to feel embarrassed, but rather, tested more rigorously and encouraged to continue seeking knowledge and experience for the betterment of the industry as a whole. While some may fight with English they don't request that courses bat the Australia establishment be educated in their lingo. Nor do they request to miss seven days from class to travel. The viewpoint is completely changed.